Freethinkers Anonymous > Ramble With Me. There’s a Nashville tour bus that passes in front of the building where I work. In the summer months it’s open and people hang out of the windows. I wave at them as they pass by. Some wave back which makes me happy. I want visitors to enjoy themselves and feel welcome and think of this as a friendly place then go home because there’s too much traffic, but that’s another story. Sometimes when the buses pass by me they’re completely empty, and you might wonder why they bother, but people don’t buy just one tour; they buy an all-day ride and can hop on and hop off wherever they want. I’ve been at the Parthenon when the tour bus is there and overheard people say, “We’ll get the next one.” So, unlike most tours, they’re not bound by the schedule can stick around and look spend time at a specific place that interests them. It’s winter now and the buses that go by have clear plastic windows that hang down like curtains. I can sort of make out people behind them but if they wave back I can’t see it. And the buses have a wreath on front, which is something new, or at least something I’ve never seen before. One day before a meeting a coworker and I started talking about the tour buses and travel in general, and I said I like small towns and I’m intrigued by islands–that if I could travel as much as I wanted places like New Caledonia, Tuvalu, and Yap are at the top of my list. “Are you a completist?” she asked. I’d never heard that term before but I loved it. Yeah, I like the idea of a small place because I hate going somewhere and feeling like I’ve missed things. There are places I want to go back to–Chicago, Cleveland, and Los Angeles are high on my list–because there are still things in those places I want to see. And that’s one of the challenges of travel: do you go somewhere you’ve never been or back to someplace you’ve seen for something new? Because everywhere there’s always something new. Every place is always changing, every place has something you’ve never seen before. Even Nashville, where I’ve lived my entire life, has constant surprises. Maybe one of these days I’ll take that tour to see what the city has to offer that I haven’t seen before, and by taking the bus I won’t add to the traffic. On March 13th, 1781 the astronomer William Herschel spotted what he thought was an unusual comet but which he and other astronomers would quickly discover was a planet. It’s the first planet discovered in modern times which makes Uranus very special. Take a little time to explore Uranus, probe its mysteries, and consider what we’ve learned about Uranus since William Herschel first looked up and saw it two hundred and thirty-seven years ago. Like its neighbors, Jupiter, Saturn, and Neptune, it’s a gas giant. Uranus is full of hydrogen and helium but also in its depths contains ice and rock. 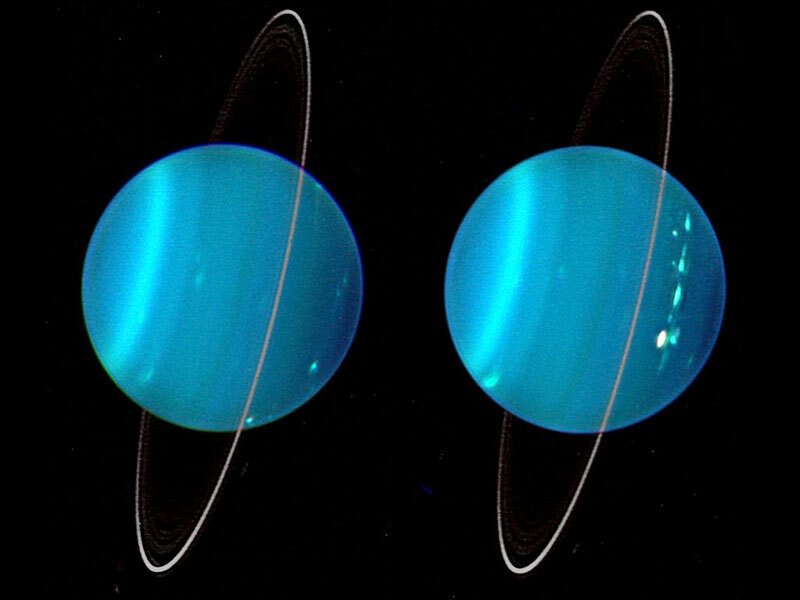 Uranus also has a complex cloud system with the lowest clouds believed to be made up of water while the upper layers are methane. There’s a lot of methane in Uranus. On January 24th, 1986 the Voyager 2 spacecraft probed Uranus. Astronomers at the time called it “the most boring planet” but subsequent studies have shown just how interesting Uranus is. Less than a decade earlier, in 1977, astronomers first discovered rings around Uranus, and then in December 2005 the Hubble telescope detected two additional rings much farther out. There are also twenty-seven known moons orbiting Uranus. The largest, Titania, orbits Uranus every 8.7 days and because of its closeness to the planet the same side always faces Uranus. Uranus itself orbits the Sun every eighty-four years, which means that since its discovery Uranus hasn’t even been around the Sun three times. However Uranus has a very fast rotation: one day on Uranus is just seventeen hours and fourteen minutes. Of course Uranus is not alone. There’s also the city of Uranus, right in the middle of Missouri. Uranus is a well-known tourist stop along the historic Route 66, although I think the stretch surrounding it should be renamed the Herschel Highway. 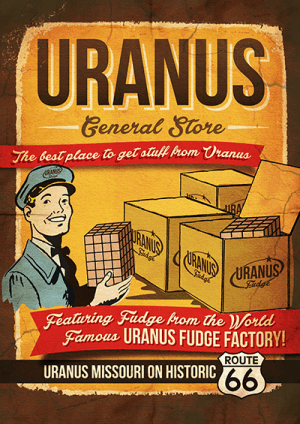 The city is known for its fudge factory and also a tattoo place for people who want to be able to say they got a tattoo in Uranus. Today and every March 13th I hope you’ll join me in spending a little time contemplating Uranus. Nowawadays travel is easy, or at least easier than it used to be. You can use the web to look up schedules, maps, points of interest, and even estimate times–you can plan out a whole itinerary without leaving your chair. This doesn’t prevent accidents from happening or things going badly–the best laid plans of mice and travelers, you know–which is something I thought about while listening to “The Holiday Coping Mechanism Spectacular” episode of The Hilarious World Of Depression podcast. Host John Moe shares a story about the year he and his wife decided to skip seeing their families for the holidays and take their young children to Sequim, Washington, which, as soon as he mentioned it, I added to my list of places I want to go, which, admittedly, covers pretty much the entire planet, but that’s another story. The trip wasn’t exactly disastrous, but it wasn’t as happy as they hoped either. No spoilers–go listen. You won’t regret it. And it took me back to a place I’ve visited several times–metaphorically, since I haven’t been able to go really go back since I last passed through in 1991. While I’ve mentioned the little Welsh town of Carmarthen in previous yarns about my pilgrimage to the home of Dylan Thomas I’ve never given it the space it deserves. It was purely an accident that I found myself there, and even though I was just passing through I kind of fell in love with the place. The first time I even heard of Carmarthen it was just a dot on the map, the end of the train line but close to my intended destination. And also I’m very much a freewheeling traveler. The best thing on any trip, for me, is to be surprised, which is why I set off on so many journeys without a clear idea where I’m going. The best part of any journey is the journey itself when you don’t have a destination. So I left Swansea on a rickety train that I’m pretty sure dated back to, and may have even been built by, George Stephenson. It was dark and cloudy most of the trip and then pouring rain by the time we pulled into the Carmarthen station. It was late on Saturday night and without realizing it I’d taken the last train. It was in the train station that I found the information I’d need for my second, and more successful, trip to the home of Dylan Thomas. Still I was stuck spending that night in Carmarthen and, because everything in Wales shuts down on Sundays, I wouldn’t be able to take the train back until late the next afternoon. On that second trip I was, of course, better prepared: I made it to Dylan Thomas’s home and then took the last bus back to Carmarthen. I struck up a conversation with a guy on the bus who informed me he’d never met an American before. We made plans to meet up later at the pub, although we didn’t specify which pub and Carmarthen, small town that it is, has about fifty pubs. And anyway when I got off the bus I stepped right into an enormous crowd. I wouldn’t be surprised if the entire town was there because it was the lighting of the town Christmas tree. The mayor of Carmarthen was there with the city council and he made a nice speech wishing everyone a happy holiday season then turned on the lights. Everyone cheered and started milling around and going to pubs. I went in to one too and spent the rest of the evening talking to several nice people who informed me I was the first American they’d ever met. Before that I shook hands with the mayor, although I didn’t get to talk to him, unfortunately, because I might have been the first American he ever met. It was a month before Christmas but being there for the lighting of the Carmarthen tree, to be able to spend an evening with the people who lived there, to share in their holiday spirit and their pride in the little Welsh town at the end of the train line, was a fantastic gift. And the best part is I hadn’t even planned it.